” The Supreme Court has said that dealing with the Ram Mandir issue at Ayodhya is not their priority, (inspite of crores of Hindus having stake in it) . Therefore, we have no other option but to build a people’s movement by which people will put pressure on the government to pass a law. It is for the government to see what needs to be done to build the temple. Those who want the Ram Mandir at Ayodhya must ensure that this the last leg of this long movement for the temple. We will need to go in batches to construct the temple and hence we must not rest till that dream is fulfilled. ” translated from RSS Sarsanghchalak’s speech at VHP Hunkar Rally in Nagpur on 25th November 2018. This entry was posted in Hindutva, History, RSS, Video and tagged Ayodhya, Ram Mandir on November 26, 2018 by arisebharat. This entry was posted in Hindutva, History, Nation, RSS and tagged Ayodhya, Ayodhya temple, Ram Temple at Ayodhya, SriRamaJanmabhumi on December 6, 2017 by arisebharat. Welcoming Prabhu Sri Ram to Ayodhya with nearly 1.7 lakh diyas (earthen lamps) at Ram ki Paudi, marked the grand celebrations of Deepavali this year (Vikram Samvat 2074), while a helicopter decorated as “Pushpak Viman” carried Prabhu Ram, Mata Sita and Lakshman Bhayya who were symbolically represented by artists, descended on the Ram Katha Park near Sarayu river in Ayodhya, at the birth place of Sri Ram. The grand event of this magnitude has happened nearly after “490 years” to the delight of all Bharatiyas filling the spiritual fervor and happiness, reminding us of the nostalgic era of Bharatiya Itihas – Ramayana. It was in the year 1527 AD, that “Sri Rama Mandir” in Ayodhya was destroyed and demolished by Babur – the barbarous invader. Most celebrations since then were subdued in Ayodhya. Even after Bharat attained independence in 1947, nothing of this magnitude could ever have been imagined. Let alone celebrations, the very birth place of Prabhu Ram was itself challenged and his very existence questioned! The need for a grand Mandir at Ayodhya is still a distant dream, which is being continuously debated and challenged in courts. The then CM of UP, Mulayam Singh Yadav inorder to checkmate the Mandir movement had ordered indiscriminate firing at Karsevaks and Hindu pilgrims at Ayodhya, only to appease certain sections of the society with his vote-bank politics. The firing at Karsevaks took place on October 30, 1990, when the Ram Mandir movement, spearheaded by Vishwa Hindu Parishad (VHP), was at its peak. This year’s grand Deepavali celebrations led by Honorable Chief Minister of Uttar Pradesh, Yogi Adityanath, has brought back the glory to Ayodhya in memory of the day when Prabhu Sri Ram along with Seetha mata and Lakshman Bhayya, had returned to Ayodhya as a Victorious King. Also, these grand celebrations acquire a spiritual and the political significance, as this is the same Sarayu ghat, where Karsevaks were fired upon by police on the orders of the then CM of UP, Mulayam Singh. 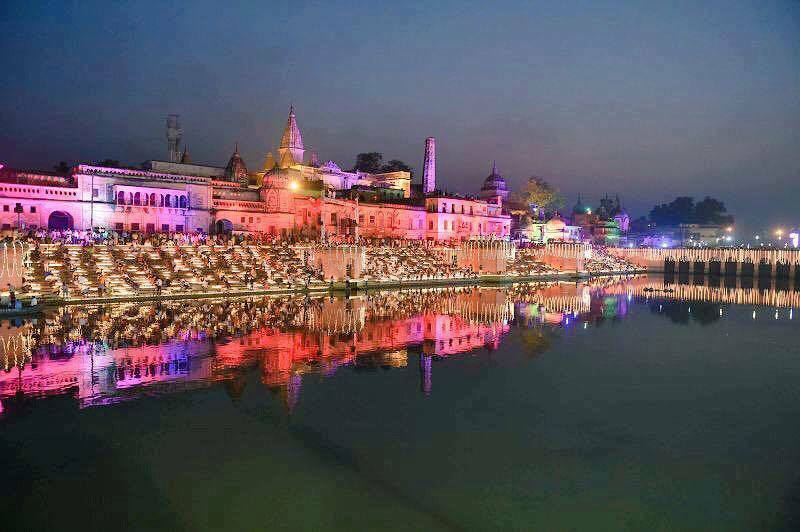 By lighting around 2 lakh Diyas, Hon.CM Yogi Adityanath has paid respects to our beloved “Karsevaks” on the banks of river “Sarayu”. These grand celebrations with offering of “Maha aArati” signified the welcoming of Prabhu Sri Ram have once again rekindled hope in Crores of Rama Bhakts, who can reassert and feel proud of being a Hindu. The awakened Hindu has sensed that our festivals and the celebrations are the ones that have kept Hindutva alive, and hence will no longer tolerate any more onslaughts against Hindu ethos. That is why, DESPITE judicial overreach by the ‘milords’ of Supreme Court to curtail Deepavali celebrations on ‘experimental’ basis, the entire Bharat has gloriously burst the Deepavali crackers, and more this time! May Prabhu Sri Ram continue to inspire us towards Rama Rajya, a Dharmic way of life. Jai Sriram. Shubh Deepavali. सियावर रामचंद्र की जय, शुभ दीपावलि. 1.Hon.CM Yogi Adityanath Offers Prayers On The Banks Of River Sarayu. 2. 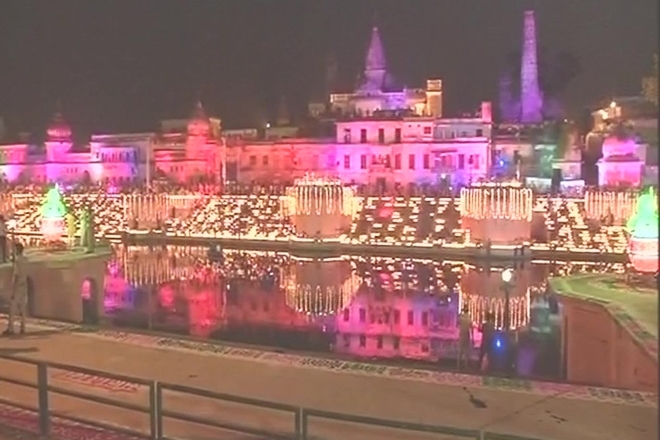 Hon.CM Yogi Adityanath celebrates Diwali in Ayodhya. 3. अयोध्या में भव्य दीपावली महोत्सव. This entry was posted in Hindu Dharma, Hindutva, Nation and tagged Ayodhya, Ayodhya Ram Mandir, Babur, Deepavali, Deepavali 2017, Ram Temple at Ayodhya on October 20, 2017 by Swadhyaaya. This entry was posted in Hindu Dharma, Hindutva, Nation and tagged Ayodhya, Deepavali, Diwali on October 20, 2017 by arisebharat. So the Hindu Society fought a total of 76 battles till the year 1934. Ram Janmabhoomi has been a people’s movement right since 1528 when Babur’s commander Mir Baki destroyed the temple.Every generation since 1528 has been fighting to claim the Shri Ram Janmabhoomi temple…and each generation did whatever they could to take the movement forward. Right since 1528 Hindus have constantly surged ahead in their fight to secure the Shri Ram Janmabhoomi site. After a few Muslims slaughtered a cow in Ayodhya, a pitched battle ensued between the Hindus and Muslims…the butchers who had slaughtered the cow were decimated…..and subsequently the Hindu society attacked the Babari structure thereby damaging all its three domes and took possession of the Babari structure. However, Britishers forcibly took back the Babari Structure from Hindu Society and imposed a penalty on Hindus to carry out repair work of the damaged domes.Since 1934 no Muslim has ever dared to enter the premises of Babari structure. Is the Shri Ram Janmabhoomi a political movement? No certainly not. For Hindus, a temple at the Shri Ram Janmabhoomi is not an issue of mere bricks and mortar.It is an issue of our cultural resurgence and identity, where Shri Rama, as maryada purushottam, has a prime place of importance. The movement is an expression of the collective consciousness of the Hindu ethos. In destroying the Babari structure, does it not mean that the present day Muslims are being asked to pay a price for the mistakes of those who indulged in vandalism and destruction? The real issue is how the present day Muslims view the Babari structure. Do they consider it as their holy place? If the answer is yes, then they end up owning the barbarism of Babur and others like him. The right way for Muslims is to distance themselves away from such vandalism and barbarism of the past. When the Germans are asked to apologise for the crimes of Hitler, they do not hesitate to do so, clearly indicating that they do not own Nazism. Hindus have asked for a peaceful return, through judiciary and negotiations, of only three of their holy sites (Ayodhya, Mathura and Kashi) that were vandalised. Hindus are not asking for thousands of other temples that were plundered, looted, destroyed and mosques were built thereupon. What has been the case with similar historically vandalised sites? In 1918 in Warsaw, at the end of first Russian occupation of Poland (1614-1915), one of the first things that Polish people did was to bring down the Russian Orthodox Christian Cathedral that was built by Russians in the centre of the town. This was done despite the fact Poles are Christians by faith and Jesus Christ was worshipped in that Cathedral. The Poles demolished the Cathedral built by Russians because they viewed the Cathedral not as a place of worship rather a structure that reminded them of their slavery. Around the 12th century, Spain was conquered by Moors and the people were forcibly converted from Christianity to Islam. In the 16th century, when Christians recovered the whole of Spain from Moors they gave Muslims in their country only three choices—reconvert to Christianity,leave the country along with the Moors, or be killed. All the Muslim places of worship were converted back to Christian churches. This re-Christianisation was also done with force. Why do we need to have a grand temple at the Shri Ram Janmabhoomi, in place of the existing functional temple? The Shri Ram Janmabhoomi movement is not only about bricks and mortar, but as the one that will restore honour of the nation and its culture. People take great pride inand receive inspiration from temples which signify their glorious past. This can be done only when we have a proper and full-fledged temple at the site. Is it true that the foundation stone for temple was laid by a person who belonged to the Vanchit Varg? Yes, Shri Kameshwar Chaupal of Bihar had the honour of laying the foundation stone of Shri Ram Janmabhoomi temple on November 10, 1989. It is a clear sign of the immense unifying power of the Shri Ram Janmabhoomi movement. The Archaeological Survey of India (ASI) after extensive excavations has established it beyond doubt that there did exist a grand temple at the Shri Ram Janmabhoomi site that was razed down to build Babari structure. The excavations done by ASI establish that the Janmabhoomi site was occupied prior to 7th century BC. (c) Works and reports by foreign writers. Several Sanskrit epics, Purans, Upanishads, poetries and religious scriptures from the timeof Maharishi Valmiki till modern days have numerous instances that Ayodhya is the birth place of Shri Ram. There is also a detailed description about several holy places pertaining to Shri Ram in the AyodhyaMahatmya wherein the significance of Shri Ram Janmabhumi Mandir is narrated after mentioning the location of this Mandir. Epics— Valmiki Ramayana, Ram Upakhyan of Mahabharat (Van Parva), Yog Vasisth, Adhyatma Ramayan, Raghuvamsh etc. Poetries:- Ramgeet-Govind, Geet Raghav, Ram Vilas, Ram Ashtak etc. Dramas:- Pratima, Abhishek, Uttar Ramcharit, Hanumannatak, Prasanna Raghav, Ramabhyudaya etc. Akhyan:- Bruhat Kathamanjari, Champu Ramayan, Katha Saritsar etc. Purans:- Vishnu, Brahmand, Vayu, Koorma, Padma, Skanda, Narad etc. Upanishads:- Ramottar Tapaniya, Ram Rahasya etc. Other Religious Scriptures:- Jaiminiya Ashwamedh, Hanumat Vijaya, Hanumat Sanhita, Bruhat Koushal Khand etc. Mirza Jan, who claims that he has studied various ancient sources indepth, asserts in his statements that the earlier Sultans did encourage the propagation and glorification of Islam and trampled the non-believers (Kufr) i.e. Hindu forces. Thus they redeemed Faizabad and Avadh of this mean tradition (Kufr) …… This (Avadh) was a very big centre of worship and the capital city of the kingdom of Ram’s father. There was a majestic temple on the spot a huge Musjid was constructed there on and a small canopy Mosque (Kanati Masjid) on the spot, where there was a small Mandap. The Janmasthan temple was the original birth place (Maskat) of Ram. Adjacent to it, there is the Sita Rasoi. ……Sita is the name of Ram’s wife. Hence Badashah Babar got constructed a tall (Sarbuland) Masjid on that spot under the guidance of Moosa Ashikan. The same Mosque is known as Sita Rasoi till today. During the regime of Badashah Babur, a grand Mosque was constructed on the site pertaining to Sita Rasoi in Avadh. This was the Babari Masjid. Since the Hindus were not strong enough to oppose, the Masjid was constructed under the guidance of Sayyad Mir Ashikan….. While giving details of the Dargah of Hazarat Shah Jamal Gojjari, the author writes that there is Mahalla Akbarpur on the east of this Dargah, whose other name is Kot Raja Ramachandra also. There were some Burz (Large cells with domes) in this Kot. There were the house of birth (Makan Paidaish) of the above mentioned Raja (King) and the Rasoi (Kitchen); besides, the western Burz and this premise is presently known as Janmasthan and Rasoi Sita. After demolishing and wiping out these houses (i.e. Janmasthan and Sita Rasoi), Badashah Babar got constructed a grand (Ajim) Masjid on that spot. Babar constructed a grand Mosque under the protection of Sayyad Ashikan on the very same spot where once stood the temple of Janmasthan of Ramachandra in Ayodhya. Just adjacent to it stood the Sita Rasoi the date of Mosque construction is Khair Banki (Al Hizri 923). Till today this is known as Sita Rasoi. That temple stands just beside this…..
* Kesar-ul-Tawarikh or Tawarikh-e-Avadh Vol.II : by Kamaluddin Hyder Hussain Al Hussain Al Mashahadi. Babur constructed a Masjid after demolishing the Ram Janmsthan temple…and using its pillars. Hindus refused to give up the place and they continueto come to that place in spite of the efforts by Mughals to prevent them from coming there. That they constructed a platform called Ram Chabutara in the compound of the Masjid. They circumambulate it for three times and prostrate flat on the ground before it. They were following this devotional conduct at Ram Chabutara and inside the Masjid also. This report confirms the fact that Babar got constructed the Babari Masjid in 1528 on the place of Janmasthan temple that marks the birth-place of Ram. 5. Indian Archaeological Survey Report: by A. Fuhrer – 1891 Fuhrer accepts that Mir Khan had built the Babari Mosque on the same place of Ram Janmabhumi by using several of its pillars. He has further confirmed that Aurangzeb had similarly constructed two other Mosques at Swarg Dwar and Treta Thakur Mandir in Ayodhya. 6. Barabanki District Gazeteers : by H.R. Nevil – 1902— Nevil states that a number of conflicts arose between Hindu priests of Ayodhya and the Muslims from time to time about the piece of land, where upon once stood the Junmasthan temple, which was destroyed by Babar and a Mosque was constructed on that place. 7. Encyclopaedia Britannica, 15th edition Vol. I – 1978 :- There is a mention of constructing a Mosque by Babar in place of a temple that existed on the birth place of Ram prior to 1528 AD. A photograph of the existing structure is also given in this Encyclopaedia, which has been referred to as a Mosque constructed on the birth place of Ram in Ayodhya of Uttar Pradesh state in India. Similar information were furnished in its earlier editions as well. None of the documents submitted by them have any evidentiary value and are merely opinions of people with political inclinations.There is no testimony that could show that Babur or any other Muslim Chieftain saw a vacant plot of land in Ayodhya and thereupon ordered the construction of a Masjid there. Efforts to posit Buddhism against Shri Ram does not hold ground. The fable of Shri Ram finds a place in Buddhist Akhyanas. It has been very proudly said in the Buddhist sources that Buddha belonged to the Ikshwaku clan as Shri Ram did.They have tried to question the historicity of Ramayana by asserting that there are many versions of Ramanayana. Yet again this does not hold ground. There are two different stories about the creation in Bible. Two different genealogies are given about Jesus. In fact, every story of Jesus’s life is given by authors differently in various Gospels. But no serious intellectual conclude from this that Jesus was never born. * The total area is approximately 1,480 square yards or 13,320 square feet. * Two of the three judges have ordered for allotment of 1/3rd area to each of the three main Plaintiffs (complainants) respectively—Nirmohi Akhara, Muslims and Ramlala Virajman. The court has dismissed the suitof Sunni Waqf Board. * The Government of India had acquired about 70 acres of land surrounding the disputed premises. This land is other than the disputed area and is in the possession of government of India. Allahabad High Court, yet the three judges wrote and delivered their judgments separately since this court was functioning like a trial court. 2. The disputed site is the birth place of Lord Ram. Place of birth is a juristic person and is a deity. It is personified as the spirit of divine worshipped as birth place of Lord Rama as a child. Spirit of divine ever remains present everywhere at all times for anyone to invoke at any shape or form in accordance with his own aspirations and it can be shapeless and formless also. 3. The disputed building was constructed by Babar, the year is not certain but it was built against the tenets of Islam. Thus, it cannot have the character of a mosque. 4. The disputed structure was constructed on the site of old structure after demolition of the same. The Archaeological Survey of India has proved that the structure was a massive Hindu religious structure. 5. It is established that the property in suit is the site of Janm Bhumi of Ram Chandra Ji and Hindus in general had the right to worship Charan, Sita Rasoi, other idols and other object of worship existed upon the property in suit. It is also established that Hindus have been worshipping the place in dispute as Janm Sthan i.e. a birth place as deity and visiting it as a sacred place of pilgrimage as of right since time immemorial. After the construction of the disputed structure it is proved the deities were installed inside the disputed structure on 22/23-12-1949 (December 22/23, 1949). It is also proved that the outer courtyard was in exclusive possession of Hindus and they were worshipping throughout and in the inner courtyard (in the disputed structure) they were also worshipping. It is also established that the disputed structure cannot be treated as a mosque as it came into existence against the tenets of Islam. 1. It is not proved by direct evidence that premises in dispute including constructed portion belonged to Babar or the person who constructed the mosque or under whose orders it was constructed. 1. The area covered under the central dome of the disputed structure is the birthplace of Lord Rama as per faith and belief of Hindus. What kind of evidence did the three Judge Bench go through before they gave out their verdict? The Judges took into account evidence from Muslim scriptures, Muslim Waqf Act, Hindu scriptures, Skanda Puran, Historical accounts written by Muslim historians, the Diary of a French Jesuit Priest Joseph Tieffenthaler, Gazetteers and books written by British officials and historians, Encyclopaedia Britannica, Carved stone blocks and inscription found from the debris of the structure, report of the Ground Penetrating Radar Survey (GPRS), report of the GPRS-inspired excavations conducted by the Archaeological Survey of India (ASI), and oral cross-examinations and statements of approximately 85 witnesses. A Praan-Pratishthit Vigraha (deity) is a living entity that can fight its own case, and is a juridical person. But being a perpetual minor the Praan-Pratishthit Vigrahathereforeneeds a guardian to fight its legal battles. Late Shri Deoki Nandan Agrawal, a retired judge of Allahabad High Courthad filed Sri Ramlala’s case as the deity’s Next Friend. According to Hindu scriptures and the Present Law the deity can hold the propertyand nobody can have adverse possession over it. Further, the place being Janmasthan of Bhagwan Shri Ram is not merely a property but being sacred the place itself is a deity and is worshipped. It can also fight its own case as Plaintiff (complainant). This provision in the Hindu scriptures has been there since time immemorial and the Courts of Law always accepted these accreditations. Why was the case of Sunni Waqf Board Dismissed? The Muslim Scriptures and Law lay down that no Wakf can be created on another’s property (the Deity’s seat, the Deity’s Home or the Temple) and Namaz offered in a Mosque thus erected is not accepted by Allah. In the eyes of law, therefore, the three-domed structure did not exist. Neither Babur nor his commander-in-chief Mir Baki were the owners of the disputed site and so it could not be offered to Allah. Further, even if it is accepted for the sake of argument that Muslims were in occupation of this site since 1528, then also it was never continuous, uninterrupted and peaceful. Long occupation does not endow ownership rights. Moreover, the Waqf Board had to divulge as to whose property did Babur occupy and whether he did it with the knowledge of true owner. Also, it is the view of the Supreme Court that ‘Mosque’ is not an essential part of Islam, Namaz can be offered anywhere, even in an open ground. The Waqf Board was neither considered by the Court of Law to be the owner of the disputed land nor was the structure in question accepted to be a valid mosque according to Islam. So the Suit No. 4 filed by Sunni Waqf Board was dismissed by the Court declaring it time barred. 1. Whether the building (the three-domed Babari structure) had been constructed on the site of an alleged Hindu temple after demolishing the same? Justice Sudhir Agarwal’s Answer:– Affirmative, Yes. 2. Whether the building (the three-domed Babari structure) had been used by the members of the Muslim community for offering prayers from time immemorial? Justice Sudhir Agarwal’s Answer:–The building in question (the three-domed Babari structure) was not exclusively used by the members of Muslim community. After 1856-57, outer courtyard was exclusively used by Hindu and inner courtyard had been visited for the purpose of worship by the members of both the communities (Hindus and Muslims both). 3. Whether the plaintiff (Sunni Waqf Board) were in possession of the property in suit up to 1949 and were dispossessed from the same in 1949? Justice Sudhir Agarwal’s Answer:— Negative – Against the Sunni Waqf Board. 4. Whether the plaintiffs (Sunni Waqf Board) have perfected their rights by adverse possession as alleged in the plaint (complaint)? Justice Sudhir Agarwal’s Answer:– Negative, against the plaintiffs (Sunni Waqf Board) and Muslims in general. 5. Is the property in suit the site of Janma Bhumi of Shri Ramchandraji? Justice Sudhir Agarwal’s Answer:– It is held that the place of birth as believed and worshipped by Hindus is the area covered under the central dome of the three-domed structure, i.e., the disputed structure in the inner courtyard in the premises of dispute. 6. Whether the Hindus in general and defendants in particular had the right to worship the Charans and Sita Rasoi and other idols and other objects of worship, if any, existing in or upon the property in suit? 7. Have the Hindus been worshipping the place in dispute as Sri Ram Janam Bhumi or Janmasthan and have been visiting it as a sacred place of pilgrimage as of right since times immemorial? Justice Sudhir Agarwal’s Answer:–Affirmative, Yes. 8. Have the Muslims been in possession of the property in suit from 1528 A.D. continuously, openly and to the knowledge of the Defendants and Hindus in general? Justice Sudhir Agarwal’s Answer:–Answered in Negative, against the plaintiff (Sunni Waqf Board) and Muslims in general. 9. Whether the building (the three-domed Babari structure) was landlocked and cannot be reached except by passing through places of Hindu worship? Justice Sudhir Agarwal’s Answer:–Yes, to the extent that building was landlocked and could not be reached except of passing through the passage of Hindu worship. 2. Whether the building had been constructed on the site of an alleged Hindu temple after demolishing the same? Justice Dharam Veer Sharma’s Answer:–Decided in favour of defendants (the Hindu society in general) and against the plaintiff (Sunni Waqf Board) on the basis of ASI report. 3. Whether the building had been used by the members of the Muslim community for offering prayers from time immemorial? 4. Whether the plaintiff (Sunni Waqf Board) were in possession of the property in suit up to 1949 and were dispossessed from the same in 1949? 5. Whether the plaintiffs (Sunni Waqf Board) have perfected their rights by adverse possession as alleged in the plaint (complaint)? 6. Is the property in suit the site of Janm Bhumi of Sri Ramchandraji? 7. Have the Hindus been worshipping the place in dispute as Sri Ram Janm Bhumi or Janmasthan and have been visiting it as a sacred place of pilgrimage as of right since times immemorial? Justice Dharam Veer Sharma’s Answer:– Decided against the Plaintiff (Sunni Waqf Board). 9. To what relief, if any, are the plaintiffs or any of them, entitled? Justice Dharam Veer Sharma’s Answer:– Plaintiffs (Sunni Waqf Board) are not entitled for any relief. The suit is dismissed with easy costs. 10. Whether the building was landlocked and cannot be reached except by passing through places of Hindu worship? Justice Dharam Veer Sharma’s Answer:– Decided against the Plaintiffs (Sunni Waqf Board) and in favour of defendants (the Hindu society in general). 1. Whether the plaintiffs 1 & 2 (Ramlala Virajman & Asthan Ram Janm Bhumi) are juridical persons? Justice Sudhir Agarwal’s Answer:–Plaintiffs 1 & 2 both are juridical persons. Justice Sudhir Agarwal’s Answer:–Affirmative. The idols were installed under the central dome of the disputed building in the early hours of 23rd December, 1949. 3. Whether the disputed structure claimed to be Babri Masjid was erected after demolishing Janmasthan Temple at its site? Justice Sudhir Agarwal’s Answer:– Affirmative (Yes). 1. Whether the disputed structure claimed to be Babari Masjid was erected after demolishing Janmasthan Temple at its site? Justice Dharam Veer Sharma’s Answer:–Decided against Sunni Waqf Board and in favour of the plaintiffs. (So in general, Justice Sharma decreed that the disputed Babari structure was indeed built after demolishing the Shri Ram Janmasthan temple). This entry was posted in Hindu Dharma, History, Nation and tagged Ayodhya, Ayodhya Ram Mandir, Gurumurthy, Ram Temple at Ayodhya on April 20, 2017 by Swadhyaaya.